Welcome, then, to the Panel Discussion Dozen Quintet, where I pick out just-released or out-soon comics that I think are worth paying attention to. Ready? Then, let's meet the sequential art that'll be draining your wallet this week. All you need to know about this latest issue of the stellar Superman title is that Grant Morrison's introducing a black Superman who also happens to be President of the United States. It's almost like he's making it just for me. China Mieville talked a bit two weeks ago about how he planned to write this new version of his dream comic and it's out tomorrow. Having read it already, I can say that it's trippy, down-to-earth and psychologically compelling at the same time. And the superheroes Mieville rolls out in this premiere will haunt your dreams long after you've read it. I have surpisingly fond memories of the Valiant Comics line that was being published in the 1990s, which featured sci-fi, superhero concepts shepherded by former Marvel editor-in-chief Jim Shooter. A new relaunch uses some of those same characters with brand new talent. X-O Manowar was a book about a barbarian warrior who finds and wields a suit of extraterrestrial power armor. This version comes from Robert Venditti—the writer behind the great cyberpunk crime thiller The Surrogates—and artist Cary Nord, who's done loads of great work for the Big Two. It's a book I'll recommend on the strength of its creative pedigree, despite how goofy the core concept sounds. Guy Delisle makes comics that take readers all over the world. His previous volumes have chronicled travels in North Korea and Myanmar, bringing strongly observed details about those closed-off societies to vibrant life. 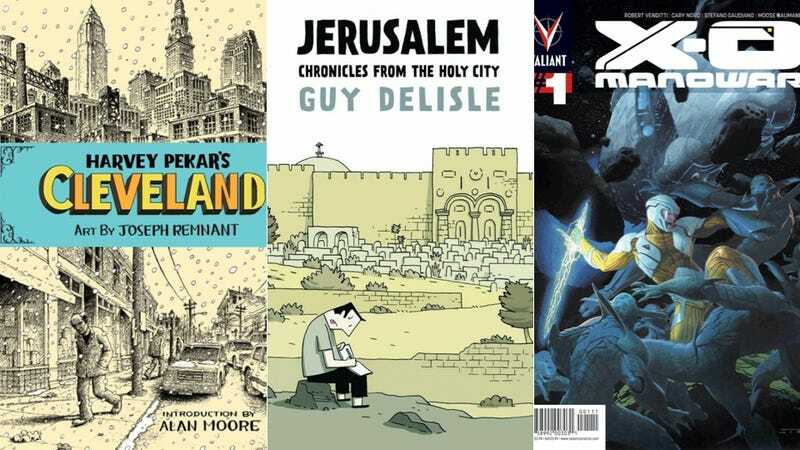 While Jerusalem isn't as mysterious as those other places, I'm still betting that Delisle's talent for observing human nature will carve out great stories fron his time in the Holy Land. Despite his curmudgeonly mien, the late Harvey Pekar stood out as a giant amongst comics creators. His mundane tales about everyday life magnifies the fleeting joys, chilling fears and nagging doubts that haunt all of us yet he never fell away from the urge to celebrate life in all its messiness. This collection represents his last work, with grittily detailed artwork from Josephn Remnant. Fittingly, it's all about Pekar's hometown which, like its native son, may always seem down on its luck but can never be truly counted out.